I'm trying to be careful to create a spoiler-free review. To be honest, I wasn't sure what to expect when I began Zombie Abbey – zombies have never been of interest to me, but young adult and historical surely is. With a paranormal take on Downton Abbey and Pride & Prejudice, I had to see where this would go. The story takes place during the 1920s, featuring an upper-crust, wealthy family in England. The narration was a bit of an issue with me – with so many narrators, it was difficult to form an emotional connection with specific characters, where you're rooting for/against them. However, this did help set the scene, offering multiple perspectives to create a well-rounded story. The Clarke sisters showed the perspective of girls in the era, while the staff showed a view historical novels don't necessarily showcase. So, in a way, the many points-of-view did paint an entire picture, even at the expense of an emotional attachment. The pacing starts slow, not truly hooking me. But I soldiered forth, mostly because this era intrigues me, and I was curious to see where this would lead. The pacing shifts to hyper-fast with action, making the last portion a page-turner. I found unexpected humor in the actions/reaction of the narrators in regards to the 'zombie' situation. Maybe because I'm a jaded adult, but the horror portions, while gruesome, were horror-lite. This isn't necessarily a bad thing in my opinion, and this is where I found humor where some might not. Overall, I'm still not a zombie fan, but I found enjoyment via the cast of characters and their interactions with one another. Oddly, I will say this was a fast yet fun book to read. While I believe this to be a standalone, the ending does leave wiggle room for a future installment. However, if this truly is a standalone novel, the ending could have been tightened up a bit. Young Adult age-range: 14+ due to the gruesome nature of zombies. Lauren Baratz-Logsted is the author of over 30 books for adults, teens and children, which have been published in 15 countries. Before becoming a writer, she was an independent bookseller (11 years), a Publishers Weekly reviewer (292 titles); a freelance editor, a sort-of librarian, and a window washer. She lives in CT with her husband, daughter and cat. Lauren prefers the nobility to zombies, as a rule, and so long as you’re not the latter, you’re welcome to visit her website. 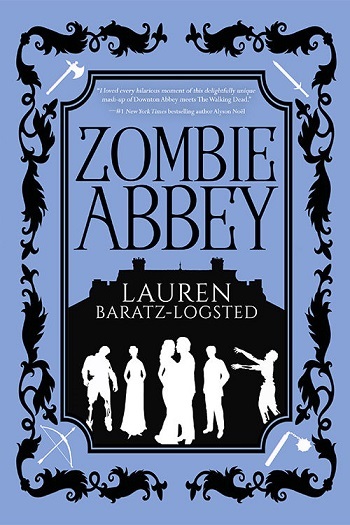 Reviewers on the Wicked Reads Review Team were provided a free copy of Zombie Abbey by Lauren Baratz-Logsted to read and review.